I love fall! It is by far my favorite season. I love the crisp air, the colors, the apples, the pumpkins, the park play dates, the not having to stress about sunscreen anymore, the jeans, the sweaters, the boots, the fire pits, and s’mores! What does fall look like where you live??? To celebrate the beginning of Autumn, Ninja Mom Designs is having a SALE on Etsy. Use HAPPYFALL30 to save 30% on all purchases. 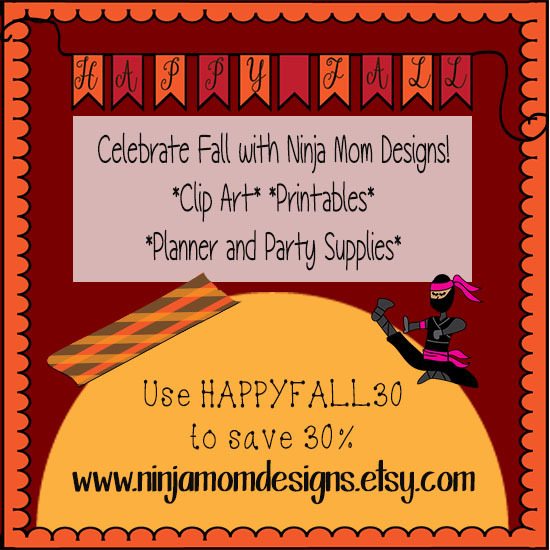 Remember use HAPPYFALL30 when shopping Ninja Mom Designs to save 30% on all purchases!! !